The layout of the power plant, and each of its key areas, are described below. Waste Wood Storage Area: Waste wood will be transported to the Plant by road and stored within the Waste Wood Storage Area until it is transferred to the Waste Wood Processing Building. Around 270,000 tonnes of wood will be delivered to the Plant each year. Waste Wood Processing Building: Waste wood will be processed within the Waste Wood Processing Building to remove non-combustible material (such as metal) and produce woodchip. This woodchip is transfer by conveyor to the Woodchip Storage Building. Woodchip Storage Building: The Woodchip Storage Building will store the woodchip prior to being transferred by conveyor to the Power Island. The Woodchip Storage Building can hold enough woodchip to fuel the Plant for around four days operation, although the actual quantity of fuel stored will fluctuate from day to day. 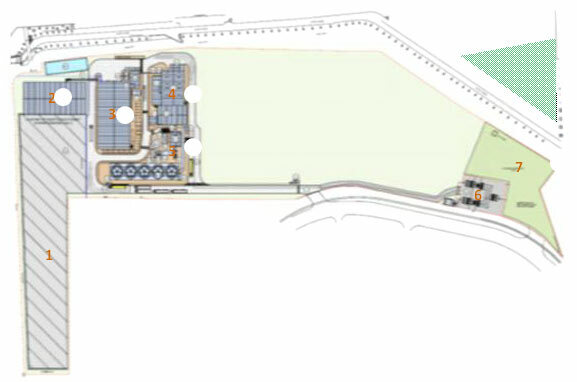 Power Island: Woodchip will be transferred from the Woodchip Storage Building to the Power Island where it will be combusted within a single travelling grate boiler under tightly controlled conditions, to produce high pressure steam. This steam will pass through a single steam turbine to generate electricity. Exhaust gases generated from the combustion process will pass to the Emissions Control Area. Emissions Control Area: Emissions from the Plant will be rigorously controlled and monitored to ensure they meet the strict emission limits. Emissions control technology used at the Plant includes Selective Non-Catalytic Reduction (SNCR), fabric filters, and dry lime and activated carbon injection. Exhaust gases will be discharged via a 100 m high stack, and will be subject to continuous monitoring. 132 kV Electricity Substation: Electricity generated by the Plant will be transferred by underground cable to the Plant’s 132 kV Electricity Substation, and subsequently along a 4.5 km underground cable to the existing 132 kV substation at Tilbury. From here, the electricity enters the local electricity distribution network. UK Power Networks, the local electricity distribution network operator, is responsible for the construction of the 132 kV Electricity Substation and underground cable. Ecological Habitat Areas: Ecological Habitat Areas will be developed by TGP to promote habitat creation and diversity. A range of habitat and landscaping features will be developed including planting of native, ornamental and nectar-rich trees and shrubs, and the establishment of bird boxes, bat boxes, a bat shelter, and reptile shelters. Phase 2 Development Area: The Phase 2 Development Area will accommodate a ca. 20 MW Solid Recovered Fuel power plant. No decision has been made on whether to proceed with Phase 2. The Phase 2 Development Area will be used as a laydown and car parking area during construction of the Phase 1 development.